I’m a fan of robotics, and so I’m delighted to see 3D printing accelerating the pace of personal robotics research. One of my favorite articles to write was the Robotic Arms edition of the Thing of the Week. I also covered the InMoov project, which is an open source 3D printable robot. Additionally, I have great interest in how 3D printing is changing the world of prosthetics, for those missing feet and hands, as well as ears and noses. So when 3D printing, robotics, and prosthetics come together in a single project, I get giddy. That’s exactly what happened when I saw the 3D Printed Robotic Hand on Kickstarter. The campaign is listed under Christopher Chappel, but that’s because the other half of the team, Easton LaChappelle, is 17. Their project is off to a great start, working off of Easton’s previous work where he’d built several versions of robotic hands, the first being made of electrical tubing. He then asked MakerBot to print the hand, and of course they obliged. But he needed to update some of the design, so his parents got him his own 3D printer. The hand is now lighter and stronger. There are currently 6 degrees of freedom, including thumb actuation, and all the electronics are off the shelf, as well as the Arduino microcontroller. 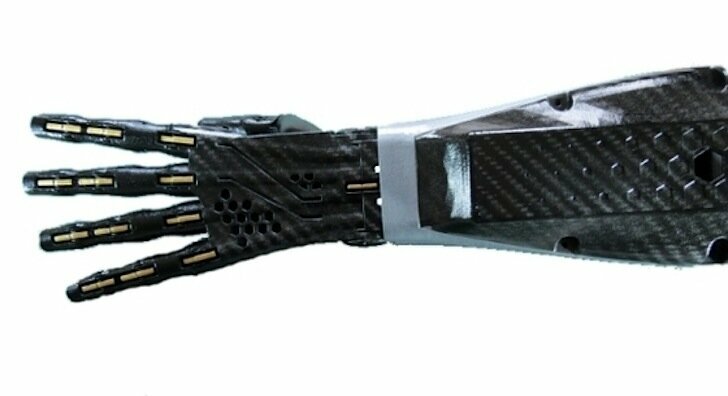 As is, the hand is pretty cool, but the long term goal of the project is getting the hand to the status of a prosthetic. Chris and Easton are frustrated with the costs and limitations of prosthetics, and they want to make them more useful and accessible to those that need them. It’s an admirable goal. I noticed that Easton lives in the same state as me, so I contacted him and asked for a brief interview. Despite being incredibly busy, he kindly answered my questions. Me: What kind of printer do you have? Easton: I have one printrbot+ and a printrbot double wide. Me: What are your plans for school? Easton: Currently I’m in high school and I really hate it! I can’t wait to get out of it. Every day I waste my time going there. College is definitely in my future… definitely some type of engineering major… but I need to play everything smart so my business and college don’t fail. Me: Do you have any other projects in the pipeline? Easton: I have been thinking about making a cheap version of an exoskeleton walking device. So say if someone was paralyzed, they put those over their legs and it will walk for them. Really I want to help people! A typical response about high school from someone so bright and ambitious; he’s already been approached by top universities. With three weeks left, the campaign is already halfway to its goal. I encourage you to go make a pledge and help these gentlemen help the world.